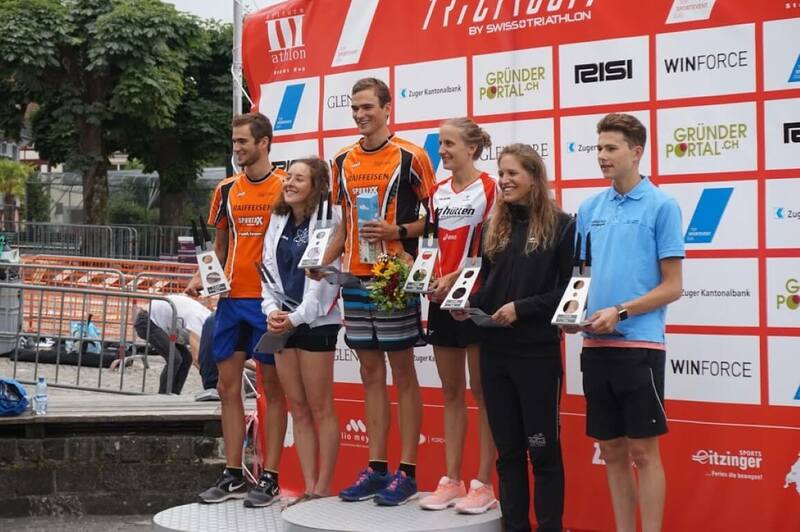 One week to recover; all we decided to give our poor legs after their remarkable performance at the 70.3 in Rapperswil. It’s not much, but somehow it should be enough for an Olympic in Zug. Or so were our thoughts a few months before hand while making our registrations. 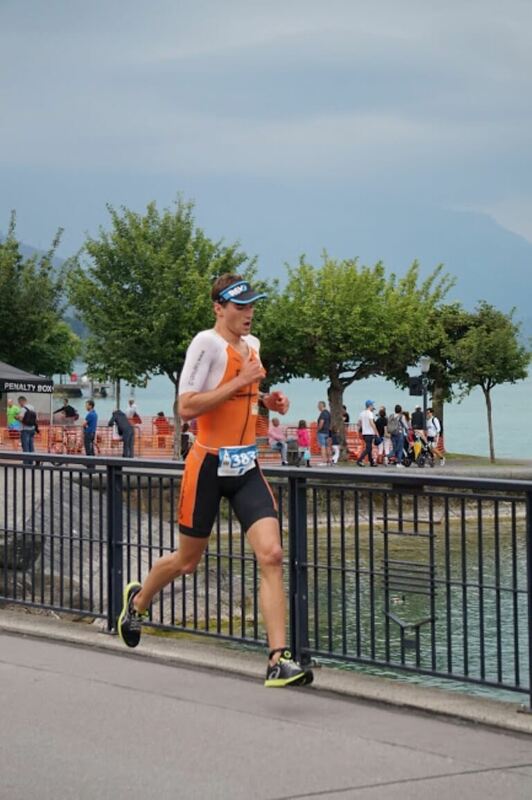 In reality, the week passed by rather quickly, and if I was mentally prepared to race again, it wasn’t always obvious I would be physically able to. On Monday for instance, my left Achilles tendon was hurting so much I feared I might have to DNF after the bike. Tuesday and Wednesday were much better, and then Thursday relatively bad again. 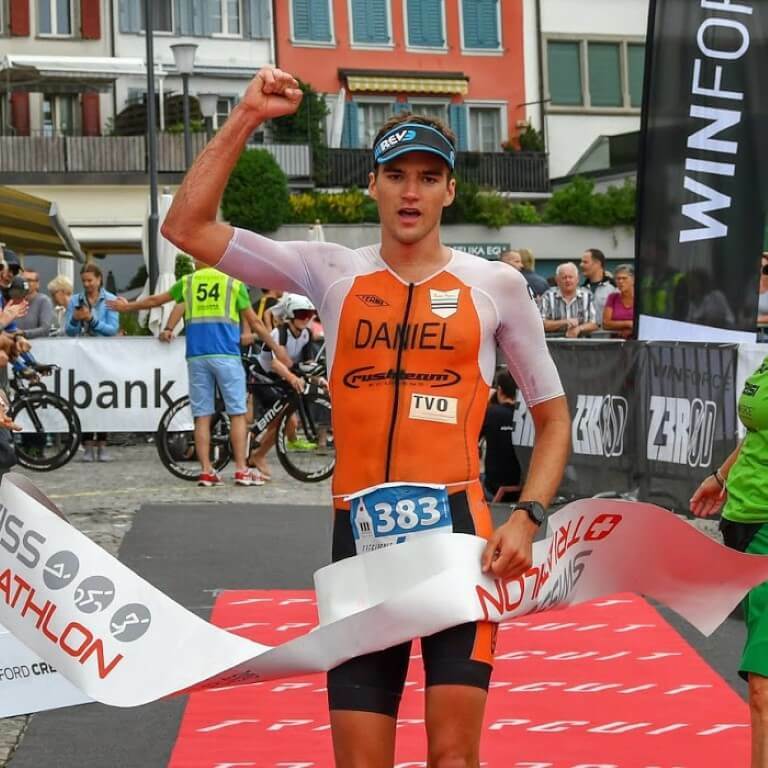 Whatever, my wish is to go full-out on the bike and be FAST for once; running and overall performance is not my first priority – no matter how odd it may seem, this was actually my state of mind. Coming into race-week and race-day like this has both advantages and disadvantages. On the one hand, I didn’t feel any stress or pressure to run on my tendon to “make last-minute tune-ups” for instance. On the other hand, I just plain forgot to take my swim skin with me until they announced at the check-in that the wetsuit was forbidden. Hum, ups. I am usually happy when this happens, but I really didn’t expect it in June in Zug. I guess that won’t be too bad on 1.5k swim, my quick estimation being around 20s lost (2s/100m difference, or 30s, minus 10s to remove it). Nevertheless, I still believe I have my chances to be the first out of the water and ride my own pace at the beginning of the bike course. My hope is to be at the front during the first half at least, and just have to hold on to someone overtaking me in the second half. I know it won’t be easy with guys like Ronnie, Fabian, Jean-Claude, with possibly some of them riding close together. 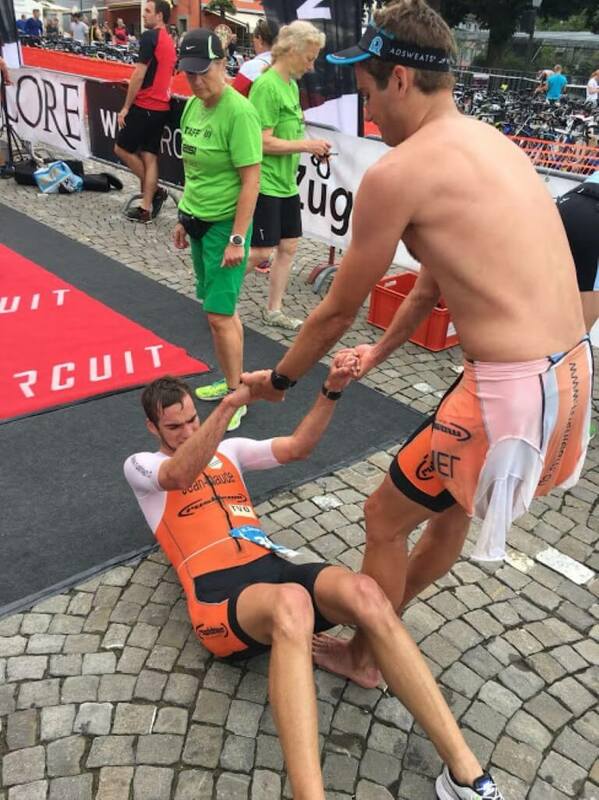 Swim exit (© photo Swisstriathlon). To make this happen, I have to pull out a good swim. And sadly it doesn’t start all too well. My arms simply don’t want to sprint at the gun. Jean-Claude is on my right, Fabian on my left, and I struggle to maintain their rhythm. Slowly but surely this sensation goes away and I can switch to the second gear to join Jan Tahlmann. The first buoy is approaching and what seems to be a large group is not too far on the right. Just before the turn, I can finally take the lead and begin to feel my strokes pushing against the water the way I’m used to. Mentally, I want to make up for this missed start, pushing stronger and stronger. A few hundred meters go by before I get back to my normal pace. Now, all I have to do is follow the leading kayak to the finish arch. Not a great swim, definitely not the same sensations as in Rapperswil, but not a bad swim after all. Push, push, push. It seems that I only have this in mind as soon as I jump on the saddle. I know perfectly that I have some aerodynamic gains to confirm today and don’t need to hold back anything for the run. As such, I launch myself in an endless, and mostly lost, pursuit after the motorbike. My head stays fixed on the Edge much more than the scenery without worrying too much about the constantly above 300W power numbers. I have to, right? Well, on the bright side, it seems that at least Jan didn’t try to follow me. On the less bright one, my quads start hurting after 10k already. “It’s only a quarter of the race”, I think at first. Actually, it’s already a quarter of the race! Keep pushing, keep pushing, keep pushing. The moto didn’t change that much from the beginning. I only have a bit more often the impression that I hear someone overtaking me. Aero position. The only problem is that you don't see where you go. The rest of the ride is nothing very interesting. I’m still fighting the same, quads saying I’m crazy, head answering she doesn’t care. Mostly, it’s a big win, for the head as well as for the performance. 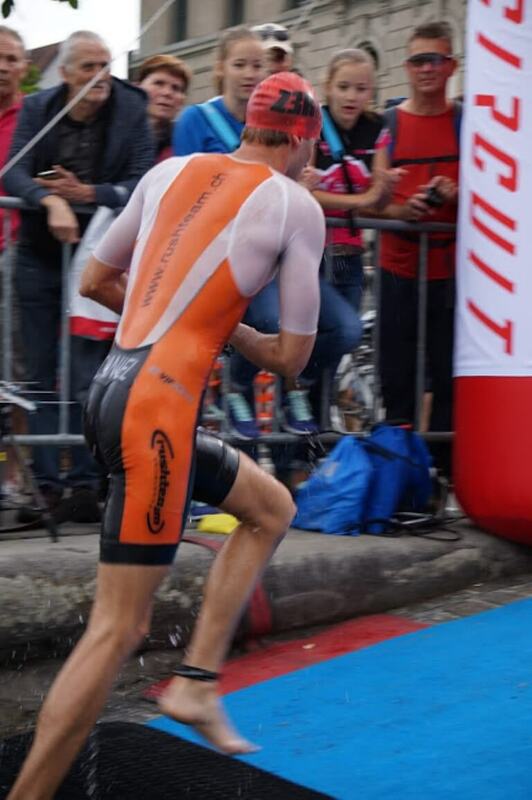 Aggressive like hardly ever before, both in the position and the pace, I am very happy to get to the transition after less than 55’ (42.7km/h) and still leading alone. Running was the uncertain part. First, I have a tendon that has shown to be difficult in the past weeks, and second, the quads have already given most of what they had on the bike. Still, with one to two minutes in T2, I should be able to run at my pace and not get too much into troubles. Let’s say, I run a 35’, that would mean Jean-Claude or whoever is with him should run below 33’. If there’s Ronnie, it’s actually possible. 35’ is safe though? Thankfully, all these thoughts don’t bother me all too long and I get into my flow. I prefer not to look at my watch however, not quite sure I am running what it feels like, especially knowing that I roll my foot a bit more than usually. The more the kilometers go by, the more confident I feel. It is hard, but there is something in me wanting to believe I can make it and I could even sprint, would anyone catch up with me. Between marks 8 and 9, I have my small down-moment with breathing getting suddenly more difficult. That little snag is thankfully nothing to worry about and I feel like rushing towards the finish line, happy like a kid. 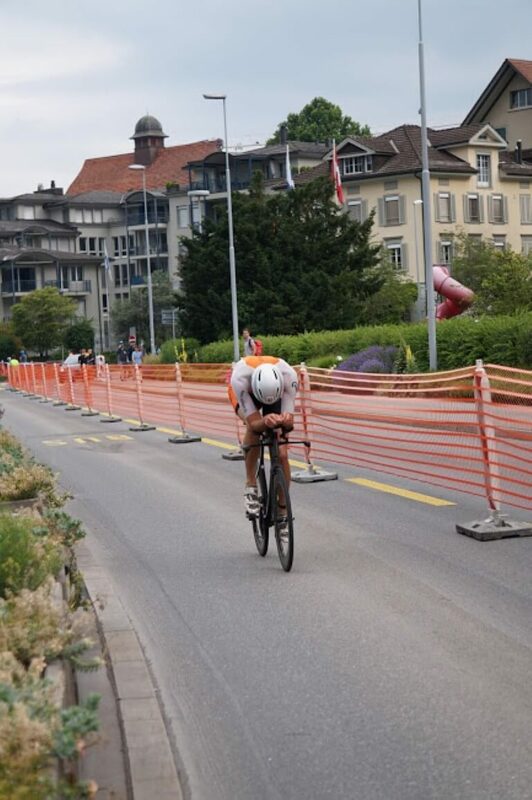 Finish line (© photo Swisstriathlon). With Jean-Claude at the finish. After a quick chat with Cendrine, Jean-Claude is already here, taking the second place by a short margin on Jan and Fabian. He doesn’t look good by the way he runs and shivers lying on the ground shortly after. The job is nevertheless done, and quite nicely. I did what I wanted to and am happy that the legs responded the way I hoped. What makes me the most proud is that performance at both Rappi and Zug followed the plan I had in mind – even though I must confess, beating Ronnie was more a dream than a plan, comparing times with different start is always perilous though. If the tendon recovers fully, which I hope by giving it some time with less running, I can focus on Zurich with high confidence.